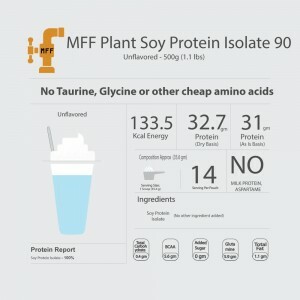 What is MFF Plant Soy Protein Isolate 90? MFF Plant Soy protein Isolate 90 is the one of the refined form of Soy Protein Isolate available in the market today. Soy Protein Isolate unflavored variant provides approx. 90% protein on dry basis with high source of naturally occurring amino acids. It is very low in carbohydrate and fats. This product is instantized which make it very easy to mix and digest. 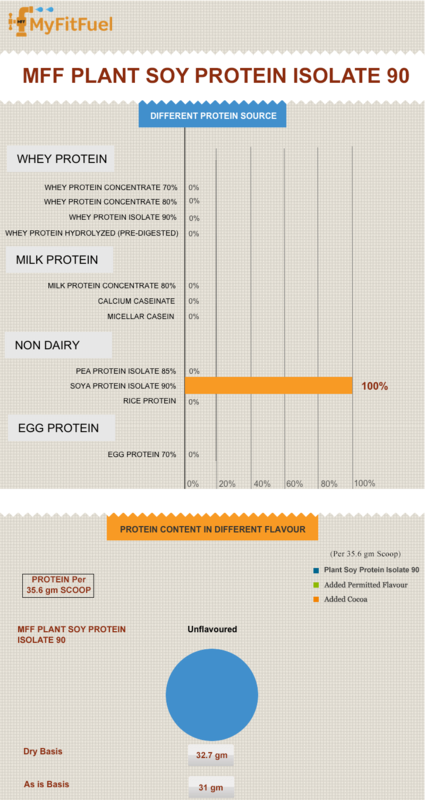 How is Soy Protein Isolate made? Soy protein Isolate is made after stringent quality checks to provide good quality source of protein with high amount of naturally occurring amino acids. Soy Protein Isolate 90 is made from Soy bean which is further isolated and defatted to remove most of the carbohydrates. --> Approx. 31gm protein (As is basis) and 32.7 gm Protein (dry basis) in every recommended serving of unflavored variant. --> Rich Source of naturally occurring Amino acids. Provides 5.6 gm BCAA, 5.9 gm Glutamine and approx. 11.9 gm Essential Amino acids in every --recommended serving of unflavored variant. --> 100% Lactose free protein and no milk ingredients added. --> Helps in muscle repair, recovery and growth. --> Plant based product which is suitable for vegetarians and vegans. --> High refined form of isolated protein. --> Very good source of protein to complete the daily required protein diet. --> Provides complete Amino Acid profile. --> Best dairy alternative source for Vegetarians and Vegans. --> No protein spiking, no artificial sugar or color added to reduce the quality of the product. --> Contains very good mixability and is very easy to digest. 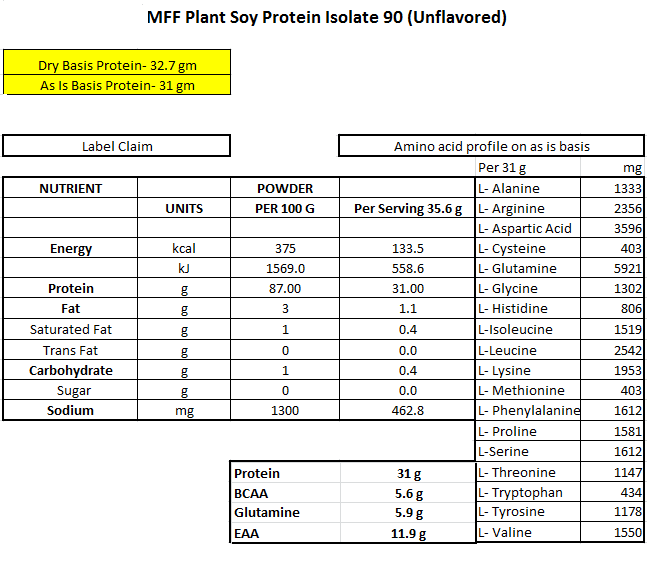 Please check the nutrition chart for complete nutrition detail of all other variants of Isolate Soy Protein 90 by MyFitFuel. Complete Amino Acid Profile of Soy Protein Powder. Best soy protein powder naturally provides the complete amino acid profile. It contains all the amino acids which make a complete protein. Complete protein works as a fuel for our muscles and helps to repair, recover and grow our muscles tissues for healthier and stronger muscles. Many individuals due to medical condition cannot consume milk based products due to the natural source of lactose present in the milk. 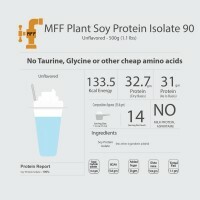 MFF Plant Soy Protein Isolate 90 is 100% lactose free. It is considered as one of the best source of dairy alternative protein which is made from soy bean with complete amino acid profile. So if you are lactose intolerant than you can confidently consume this protein. Soy Protein Isolate powder as made from the plant based soy beans is quiet easy on stomach when it comes to digesting when compared to animal based protein. So it reduces the chances of feeling bloated after consuming this product. It contains very high PDCAA’s (protein digestibility corrected amino acid score) of 1.0. which is considered as one of the best method to measure the quality of the product. No Artificial flavor, No Colors or Sugar Added. We work hard to bring the best quality products in your hands. So we make sure that what you get is more than what you expect. So for the same reason, we don’t add any artificial flavor, color in this product to keep it natural as it is. We don’t even add sugar in any of the variant. In our Unflavored variants there are no additives added making it 100% pure and refined isolated soy protein powder. Educating our customers has always been our priority. Like we were the first one to bring 100% Transparency in year 2013 and in same way we are the first to bring better education for our customer in year 2017 when it comes to difference between Protein calculations on “Dry basis” vs “As in Basis”. What makes MyFitFuel MFF Plant Soy Protein Isolate best soy protein powder in India? Quality- That’s our biggest priority. We never compromise in quality of our products and our isolated soy protein supplement quality is what we bet on. Consistency - Consistency in the quality is very important for us everytime. We take every measure from beginning to end to provide you the same nutrition quality. 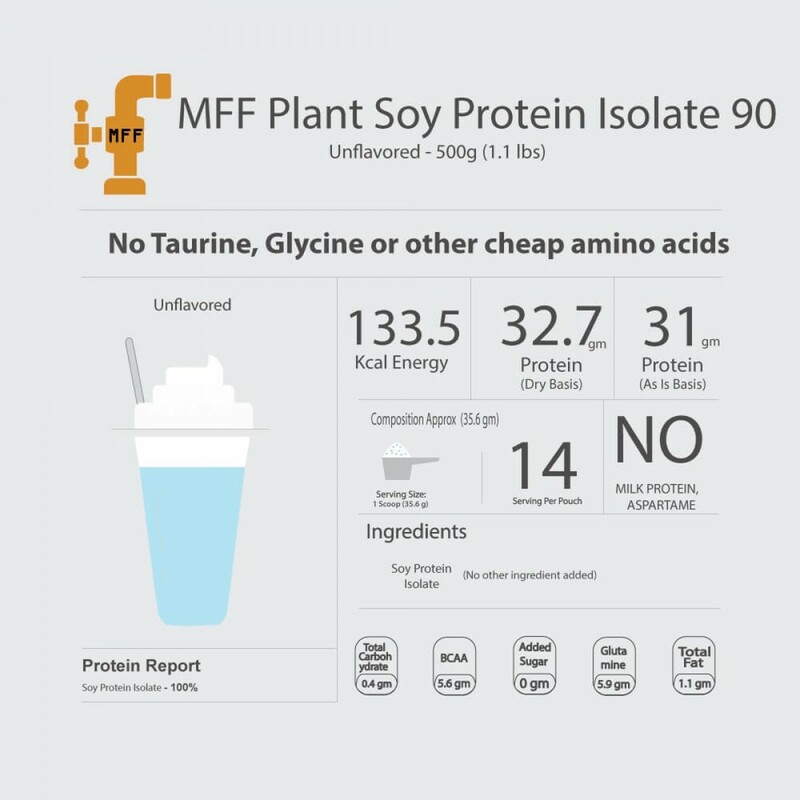 MFF Plant Soy Protein Isolate 90 ingredients are consistently tested to give you the same wonderful results everytime. Transparency- We believe it’s your right to learn about the products actual benefits and its worth before you buy soy protein online in India. Many companies never disclose right percentage of protein which is being used in the product, helping them to hide the actual worth and benefits of the product. We provide complete information in our “Protein Insight” by telling you which protein we use before you buy soy protein from us. Our transparency also helps you to always know the price you are paying us is it the right soy protein isolate powder price. Certificate of Analysis- To bring better transparency we back our protein product by including Certificate of analysis and protein insight describing the kind of protein including soy protein is used to make our product. Pour 250ml of water in any good blender like MFF™ Blender (Less the liquid thicker the shake witll be) and add 1 scoop of MFF Plant Soy Protein Isolate™. Blend it for 15-20 seconds and its ready to be consumed. Even if you don't workout, you can consume MFF Plant Soy Protein Isolate 90™ to complete to complete your daily required protein intake. But, If you workout then we have will recommend you 2-5 servings of MFF Plant Soy Protein Isolate 90™ to complete your daily required protein intake. To promote lean muscles in your body, expert suggests 1g of protein per pound body weight everyday (2.2g per kg of body weight everyday) consumed during a different time of the day. Some individuals train in the morning and some train in evening but we recommend following important serving times of Plant Soy Protein Isolate 90™. Benefits of taking with Water- Taking Plant Soy Protein Isolate with water helps you to get Lean Muscles as it reduces the overal intake of calorie from your soy protein shake. Soy Protein powder shake in water is also recommended to any individual following the restricted calories intake weight loss programme. 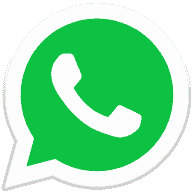 Product is good at affordable price. I have been using soy protein for long but this was 1st i bought from myfitfuel and its good. mixability is very good and i make smoothies for my husband and as we bith do running so it helps us. the price is what i expect but kindly don't increase as this is something i can afford.